Have you ever wanted to know how to sew a t-shirt but just didn't know how? Maybe you thought it'd be a lot cheaper. Or perhaps you wanted to make a fun custom shirt, but didn't want to head to the store to buy one. We've got just the post for you today. We are going to show you step-by-step how to sew a t-shirt sewing pattern. 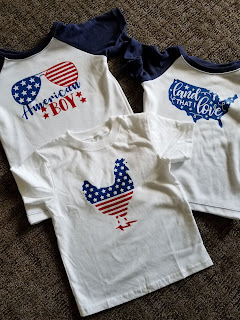 If you need a t-shirt pattern, check out the end of the post on how you can get your own kids t-shirt pattern for FREE. Let me start by saying that you can never go wrong knowing how to sew your own t-shirt. Why? We as humans love a good comfy t-shirt. My children especially. I can't count the number of times my kids came to me wanting a t-shirt for a certain holiday or event and I was able to whip one up for them and customize it. All in under and hour and before the big event. Not only did we save time by not having to go to the store, but money because the fabric is already on hand. And since children's patterns take so much less fabric, I could make them for less money as well. Here's a great example above. This past 4th of July I whipped up these t-shirts from my fabric stash for my 3 kids. I just hadn't left myself enough time to get them done before this and knew I wanted to make something. I used the Rival Raglan pattern for my oldest 2 and the Primary Tee for my youngest. I sewed them up in under 30 minutes and then added iron-on vinyl for their tees. My son's chicken shirt was a big hit especially since he loves chickens. You can use any t-shirt sewing pattern you might have or you can grab one of our many t-shirt patterns in our GYCT PDF Pattern Shop. The pattern we are using today is the full Primary Tee Pattern. Let's get started! Related: Want to learn to sew with stretchy knit fabrics? Start by printing and cutting out your PDF pattern. Each designer is different, but my patterns I can cut off the bottom and the right side. This way I can tape them together easily. Tape the pieces together and then select your size. Make sure to check the size chart and the measurements of your child so you get the correct fit. 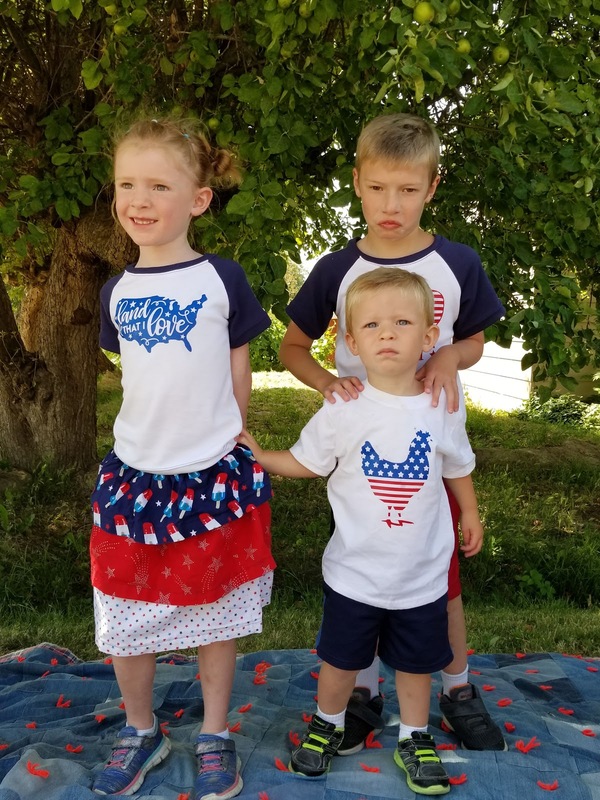 Just because your child is a size 4 in ready to wear clothes doesn't mean they are a size 4 in PDF t-shirt sewing patterns. Take your knit fabric and fold it in half. Usually I will fold one side enough to fit my pattern piece. Place the "fold" marking right up to the fold and pin. Then cut out your pattern piece. Each pattern piece should say how many to cut. For example, the Bodice front may say "Cut 1 on fold" but the sleeves may say "Cut 2 on Fold". Make sure to pay attention. You'll also need to cut out a neckband. Usually there is an extra cutting chart with measurements either on the pattern pieces or on the instructions. In this case, they are on my pattern pieces. Now we sew! With Right Sides Together (RST), match the shoulders of the front and back bodice. 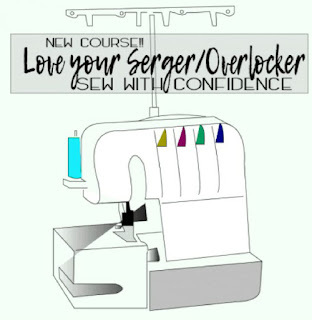 Pin both of the shoulders and stitch across with a zig zag, stretch stitch or on a serger. With RST, place neckband over neck edge of the top. Match the seam of the neckband to one of the back bodice seams. Find the middle of the neckband and match it to the opposite front seam. Pin rest of neckband in place. You may need to stretch the neckband slightly as you pin for it to fit properly. Stitch neckband to shirt. With RST, pin the center of the sleeve on the shoulder seam of the bodice. Pin the sleeve to bodice matching the sleeve and bodice as you go. Stitch across the sleeve from one side to the other. Repeat with opposite sleeve. Turn bodice so that right sides are together. Match side seams and sleeves. Stitch down the side seam. Repeat with opposite side. Now is the time you'll want to switch to your double needle. The double needle gives a really nice finished hem look. If you don't have a double needle, you can use a zig-zag stitch to finish all your hems. Fold the edge of the sleeve up ½” and press. Stitch around the hem using a double needle. Repeat with opposite sleeve. Turn the bottom edge of the bodice up ½” towards the wrong side of the fabric and press. Topstitch around the hem of the bodice. Press. Turn neckband up and press with iron. Using your double needle or zig-zag stitch, topstitch around the neckband. And you are done!!! 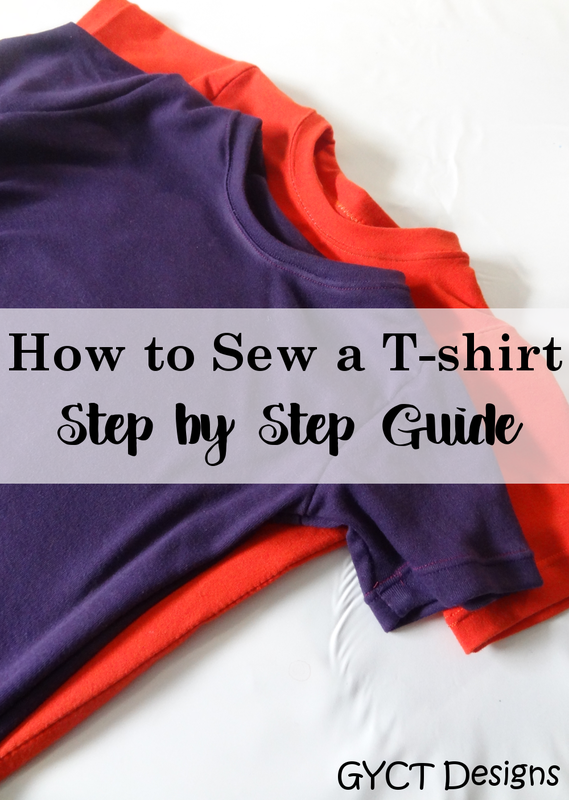 Now if you still need a little help, check out the video below and you can watch to see how to sew a t-shirt sewing pattern. Not sure if you are ready to sew with knit fabrics? Try out our Free Knit Sew Scary Course. 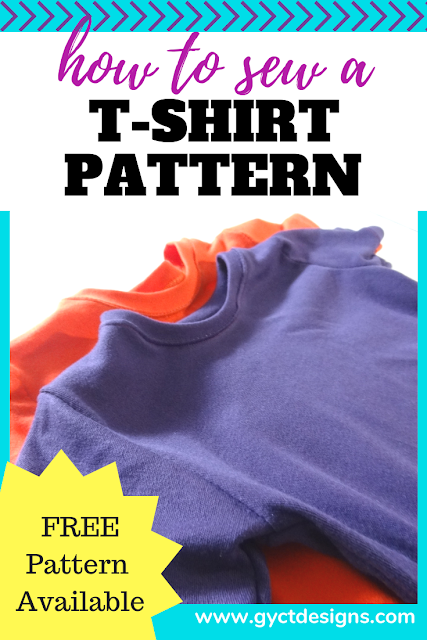 Join and you'll receive your own free kids t-shirt sewing pattern so you can practice yourself.